Prone position (/proʊn/) is a body position in which one lies flat with the chest down and the back up. In anatomical terms of location, the dorsal side is up, and the ventral side is down. The supine position is the 180° contrast. "Prone" derives from the Latin pronus: "bent forward, inclined to," from the adverbial form of the prefix pro- "forward." Both the original, literal, and the derived figurative sense were used in Latin, but the figurative is older in English. In anatomy, the prone position is a position of the body lying face down. It is opposed to the supine position which is face up. Using the terms defined in the anatomical position, the ventral side is down, and the dorsal side is up. With respect to the forearm, prone refers to that configuration where the palm of the hand is directed posteriorly, and the radius and ulna are crossed. 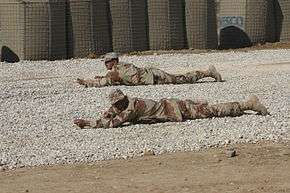 In competitive shooting, the prone position is the position of a shooter lying face down on the ground. It is considered the easiest and most accurate position as the ground provides extra stability. It is the starting position in three positions events. Currently the Olympics only have one purely prone event, the fifty meters men's rifle prone. Both men and women also have the fifty meters rifle three positions. Many video games (particularly first-person shooters) allow the player character to go into the prone position. Male shooters shoot a .22 LR calibre rifle (smallbore) over a course of fire of 60 shots to count, after unlimited sighting shots, in a time limit of 1 hour and 15 minutes (when using electronic targets). If necessary, an 'elimination' course of fire may be undertaken to reduce the number of shooters to the number that may fire simultaneously in a 'qualification' round. Each shot may score from 0 to 10 points, with no decimal points (e.g. 0,1,2,3,4,5,6,7,8,9,10, but not 3.2 or 9.8 etc.) The maximum score for an elimination or qualification round is 600 points. The top 8 shooters in the qualification round will be selected to shoot 'shot-for-shot' in an 'Olympic' final. The final is 10 shots, shot after a five-minute period for unlimited sighters. The 10 shots are shot on command in a 45-second time-span, where each shooter must shoot one shot. Following each individual finals shot, the individual shooter's score for that shot is read to the audience. Shots in the final are scored to one decimal place, e.g. a shooter may score 9.8 or 10.6 in the finals for a shot, whereas in the qualification or elimination round those same shots would score 9 or 10 respectively. The maximum score for 10 shots in the finals is 109.0, with 10.9 being the maximum score for each shot. The Finals score for the 10 shots is added to the score for the qualification round. The UK national shooting body also has courses of fire for prone shooting at multiple distances and targets. Commonly, this is split into what is known as 'short' and 'long' ranges. The NSRA generally refers to shooting .22 LR calibre rifles over a distance of between 15 yards and 25 metres 'indoors' as being short range shooting. Targets are generally outward gauging (touching a ring on the target scores the lower of the two adjacent scores), except on some of the Schools and older targets (e.g. 5 bull targets). Being indoors, no allowance is necessary for wind, light or other changes. Shots are scored as decimal values from 0 to 10, with no decimal places. UK Long range shooting is generally over either 50 yards, 50 metres or 100 yards distance outdoors. Targets vary, but generally the ISSF 50M (scaled) is used for 50 yards or 50 metres and a proportional sized target is used for 100 yards. A 50-yard, 50-metre or 100-yard target is generally constructed to allow 20 shots to count, to be executed during one 'detail' of 20 minutes duration. Sighting shots are included in that time period. Outdoors, variables such as light, wind, temperature, humidity and mirage affect the target image and bullet trajectory. To help shooters, most ranges have wind flags placed at useful positions around the range to display the wind conditions. The prone position is also used to describe the way pilots and other crew may be positioned in an aircraft; lying on their stomachs rather than seated in a normal upright position. During World War II, the bomb aimer in some bombers would be positioned this way to be better able to view the ground through a transparent panel or bubble in the nose of a bomber. Later, it was suggested that a pilot in the prone position might be more effective in some kinds of high-speed aircraft, because it would permit the pilot to withstand a greater g-force in the upward and downward direction with respect to the plane, and many speculative designs of the 1950s featured this arrangement. However, it never became mainstream, as testing revealed that the increased difficulty of operating aircraft controls in the prone position outweighed the advantages. Two examples of this approach are seen in the Savoia-Marchetti SM.93 and the Gloster Meteor F8 "Prone Pilot". 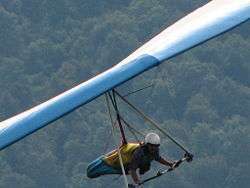 Modern hang gliders are typically piloted in the prone position. Look up prone in Wiktionary, the free dictionary.